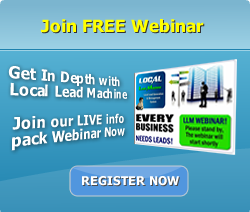 Local Lead Machine is a lead generation solution to most every business and marketer. LLM provides a turn key platform where operators can control all aspects of their lead generation from A to Z. Nothing by chance, you control all aspects of your lead business through a central portal so easy to operate, a nine year could use it. This isn’t “last years” model. LLM has been in constant development for over seven years. Continuing to evolve and better itself, this system is on the cutting edge of lead generation management and within the grasp of any business or marketer who decides to harness it’s power. What you possess is a system that will handle your lead generation campaigns with ease, which saves you time, cuts costs and creates a professional environment for any lead buyer who crosses your path. Other lead generation and management system fall short in terms of showing you how to generate leads and the best methods of prospecting for lead buyers. This is the heart of any lead generator and LLM packs a punch in this area. We provide you with loads of marketing techniques and tools to help you reach your target market, whether or not you decide to sell leads outright or work on a cost per close basis. We have you covered, no worries. Like the other guys, we don’t just hand you a piece of software and wish you well. We train you how to use it for helping your business excel to the highest level. This is the LLM advantage and no one else has it!